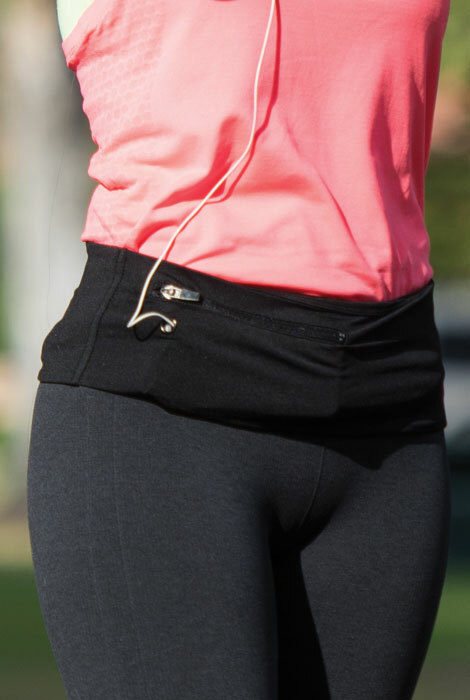 Stash cash, keys and essentials in this HSX unisex sport belt by HipsSister's zip pockets, and thread your earphones through the handy grommet hole. Designed in moisture-wicking, four-way stretch material, the 4 1/2" wide fitness belt features two 6" zippered pockets, one 3" zippered pocket and 8mm grommet hole. 90% micropoly/10% spandex. Machine wash. Imported. Black. Running belt comes in sizes B(10-16), C(18-22), D(24+). I bought this as I walk a lot on hiking trails and I had no place to put my ID, key or phone. Now I all I bring are those items and no longer a the fear someone will break into my car if they see my purse. Great belt if pockets and zippers covered whole belt. No pocket big enough for my iPhone. Pockets do not fill belt, I cut out the pockets to make one big pocket the whole length of belt, now everything gets in with everything else. Needs to just have belt separated into 4 compartments with a zippers across the top of each compartment. Half the material, cooler, and would fit everything. This will be great for travelling. I am starting to walk and needed something to put my phone and keys and this is perfect for them! This item seems to be very convenient for carrying phones and keys that you don't want to have to hold while running or walking. To hold a phone and a few cards when shorts/pants do not have pockets. I go walking with my Go Bible and head set. This looks perfect for hands free. I walk with my dog sometimes I don't have pockets. Tired of full pant pockets when out for a walk. I own two homes so I bought one for each place. sizing: what does 10 - 16 mean? is this inches? BEST ANSWER: Thank you for your question. This is equivalent pants size. We hope this information will be of help to you. Don’t understand the sizing....B C D...? BEST ANSWER: Thank you for your question. The sizes are B 10-16 C 18-22 and D 24+. We hope this information will be of help to you.